The Gambling Commission has written to bookmakers to remind them of their responsibilities in ensuring consumers are protected. 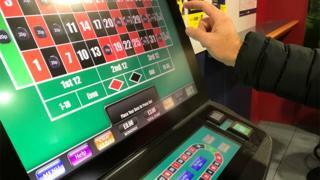 On Monday, the maximum stake that can be played on fixed-odds betting terminals (FOBT) is being cut from £100 to £2. These machines have been described as the crack cocaine of gambling. The new rules are meant to  cut the risk of players losing large amounts of money in a short space of time. Ahead of the implementation, Gambling Commission chief executive Neil McArthur has repeated to bookmakers the regulator's expectations about how the changes should be managed. "We have been closely monitoring operators' plans to manage the implementation of the stake cut and we will continue to watch very carefully to ensure that any changes and developments to these products are done with a focus on customer safety," he said. The commission is considering a range of extra measures it considers will make the whole industry safer. In May, it will bring in new identity and age-check rules, which will guard against the risk of children and those gamblers who have blocked themselves from gambling circumventing self-exclusion. It is also considering banning the use of credit cards for online gambling and improving the ways in which operators interact with a customer who may be experiencing gambling-related harm.